Bring the Party On Vacation with this Black Friday Steal! Give the perfect gift of a tropical vacation this holiday season with our hot, exclusive Black Friday deals! With our 72-Hour Black Friday Sale, you will enjoy a luxury vacation at Breathless Punta Cana Resort & Spa for just $236 per person, per night! You won’t want to miss the action at Breathless Punta Cana Resort & Spa! Book your trip now! But you’ll need to hurry to take advantage of these huge savings, because they’ll only be available for 72 hours! Book your getaway for travel between January 3, 2015, and April 10, 2015! Don’t miss the party of your life at Breathless Punta Cana Resort & Spa! Book now to nab this crazy Black Friday deal! We’ve got an activity to keep you balanced this week — literally. Paddleboard Yoga, or Floating Yoga on the Water (FloYo®), is bringing poise and strength to Breathless Punta Cana Resort & Spa all week. FloYo® takes the class out of the gym and into the water, cultivating fitness with yoga sequences and interval training performed on a paddle board. Jessie Benson, founder of FloYo®, describes her class as a full-body workout for men and women of all fitness levels, noting that FloYo® equally refreshes and connects the mind and body. The minimum age for FloYo® classes is 18, and no previous experience is required. Additional details, including class times, are available on the Hourglass Entertainment Program. FloYo® was inspired by Jessie Benson’s love of paddle boarding and water sports. Breathless Punta Cana Resort & Spa frequently offers professional Paddleboard Yoga classes, and we’re thrilled to have our FloYo® pro back for another round of innovative fitness in paradise. For more information on FloYo® or instructor Jessie Benson, please visit: http://www.floyofit.com. On this Flashback Friday, it’s time to celebrate! In honor of our first anniversary, we’re turning back the clock to November 15, 2013, when Breathless Punta Cana Resort & Spa opened the doors, turned down the lights, and turned up the music for the first time—and anyone can tell you that the party hasn’t stopped since! Danilo Medina (center), president of the Dominican Republic, inaugurates Breathless Punta Cana Resort & Spa. Breathless Punta Cana kicked off with six days of celebrations, each filled with appearances by famous musicians, political figures, and personalities from the Dominican Republic and beyond. From the awesome sets by DJ Rihannon to the resort’s inauguration by Dominican Republic President Danilo Medina, the grand opening of Breathless Punta Cana was one for the history books. DJ Rihannon pumps up the party at Breathless Punta Cana Resort & Spa. Our first guests are greeted by team members at Breathless Punta Cana Resort & Spa. Our first guests were Antonio Barnes, a prominent travel agent who has already stayed with Breathless twice in the past year, and Hassan Bashir and his wife. Famed Spanish singer Diego El Cigala also stayed as a guest of the resort. Spanish singer Diego El Cigala at Breathless Punta Cana Resort & Spa. Attendees of the grand opening festivities included Spanish Tourism Minister José Manuel Soria and television personalities Kourtney Kardashian and Scott Disick. Scott Disick and Kourtney Kardashian of “Keeping up with the Kardashians” help to ring in the new resort. Music filled the air at Breathless, featuring diverse musical performances by Juan Luis Guerra and Maridalia Hernandez, both of Dominican Republic fame, Spanish musician Pitingo, and DJ Rihannon. Juan Luis Guerra (center) performs during a grand opening celebration at Breathless Punta Cana Resort & Spa. Our Entertainment Team organized daily activities to continue the fun, including a beachside horse show, performances by a Merengue trio, and pool parties filled with foam for extra excitement. We also invited fitness professionals to lead energetic exercise sessions with guests. A guest enjoys one of the foam parties at Breathless Punta Cana Resort & Spa. One of Breathless Punta Cana Resort & Spa‘s daily fitness classes takes place by the pool. Since our grand opening, we have had countless amazing celebrations and wonderful moments with our guests and our team—and the party’s just getting started. Thank you to everyone who chose Breathless Punta Cana Resort & Spa as your vacation destination over the past year! For those of you who plan to return or want to experience our resort for the first time, we’d love to extend one of our special offers to you. We hope to see you soon! Guests enjoying the fun at Breathless Punta Cana Resort & Spa. Let’s get right to the point. We have some good news… and some more good news! 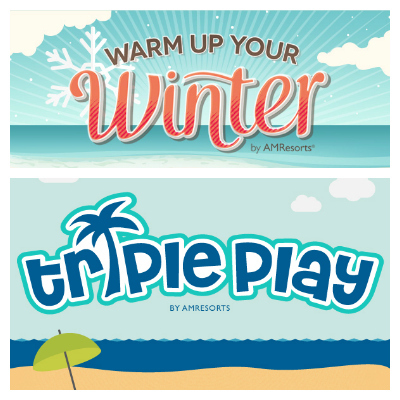 At Breathless Resorts & Spas we love a double dose of savings! Are you looking to get away sooner rather than later? The holiday season is coming and a recharge might be needed. If that’s true, than Triple Play is for you! So many ways to save if you book and travel before December 24th. With up to 50% savings and up to $400 in resort coupons you will be relaxed and ready for the holidays! Are you looking to start the New Year off right? If so, Warm Up Your Winter is for you! Save up to 30% and up to $400 in resort coupons if you book before December 17 for travel between December 25th and April 10th. No sign of winter at Breathless Punta Cana! At Breathless Punta Cana Resort & Spa, we receive many health-conscious guests who want to be able to continue their fitness routines while on vacation. 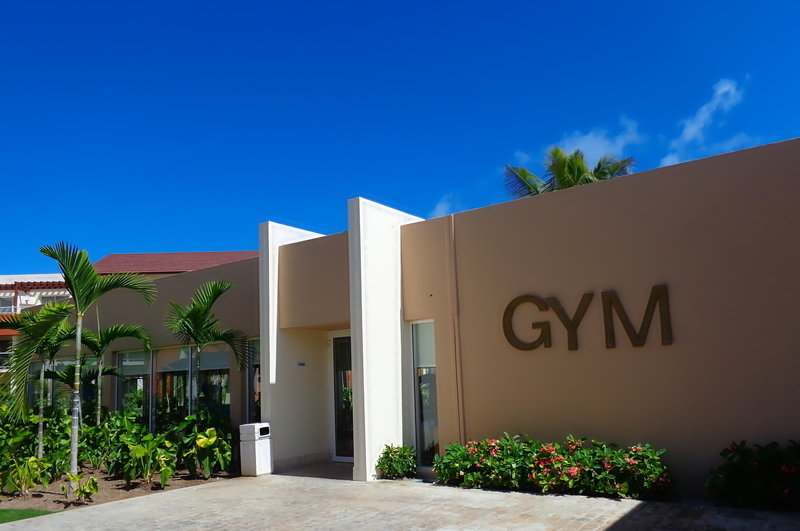 Our state-of-the-art fitness center is open daily from 6 am to 8 pm to allow our guests to squeeze in their fitness routines in between time spent lounging on the beach, enjoying gourmet meals and sipping on their favorite fruity cocktails. 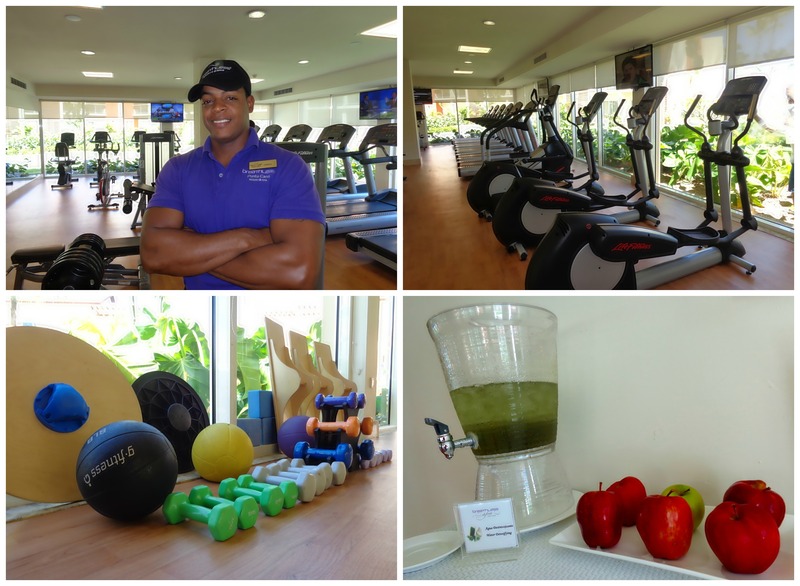 Staying fit is fun at Breathless Punta Cana Resort & Spa! 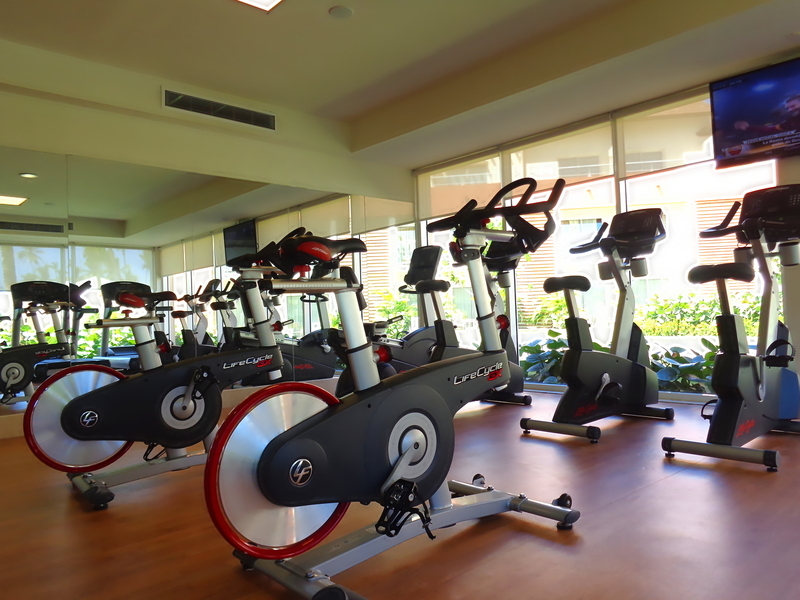 We have everything you need for your fitness routine at Breathless Punta Cana Resort & Spa’s fitness center. Located next to the spa with a view of our beautiful gardens, the fully air-conditioned fitness center features televisions, modern cardio equipment and free weights. Our fitness pro on staff, Ramón, is also a massage therapist and happy to help our guests with anything they may need at the fitness center. We also offer fresh towels, water, a detox solution and healthy snacks to help keep you going throughout your work out. 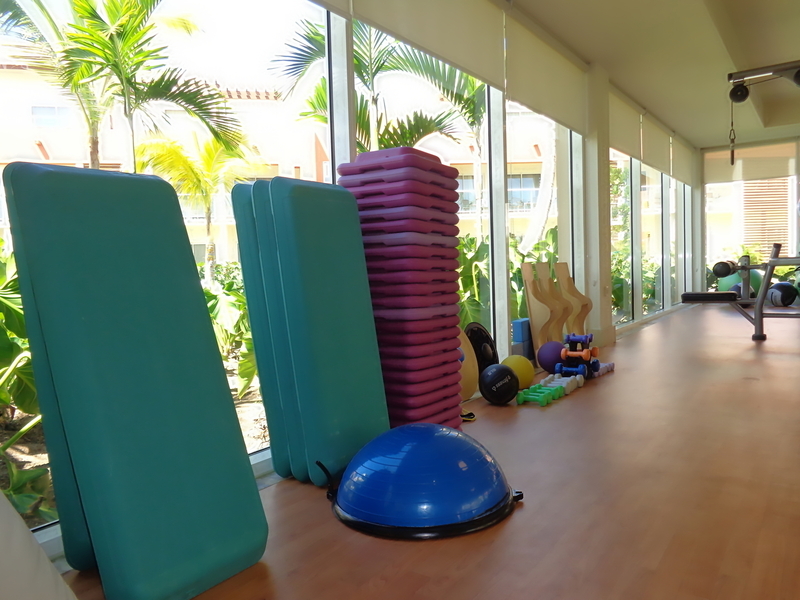 Work outs at the Breathless Punta Cana Resort & Spa fitness center come with a beautiful tropical view. Keep up with the news and sports while you work out at the Breathless Punta Cana Resort & Spa fitness center. You never have to worry about overcrowding at the Breathless Punta Cana Resort & Spa fitness center. We have plenty of varied cardio machines. Outside the fitness center, guests may also enjoy classes organized by our fabulous Entertainment Team which include yoga, zumba, aerobics and more! If staying fit is important to you while you’re on vacation, Breathless Punta Cana has everything you need to feel happy and healthy. Book your stay today! 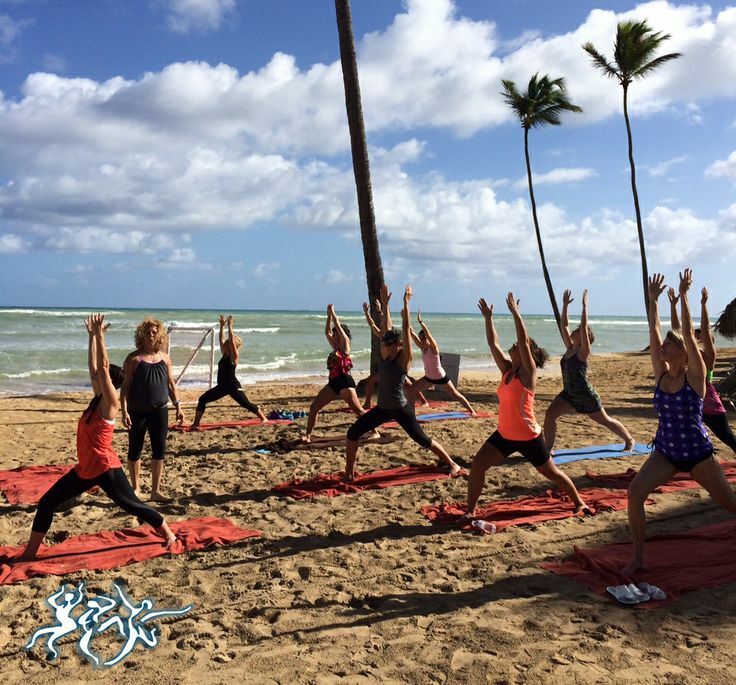 Enjoy fitness classes right on the beach at Breathless Punta Cana Resort & Spa.